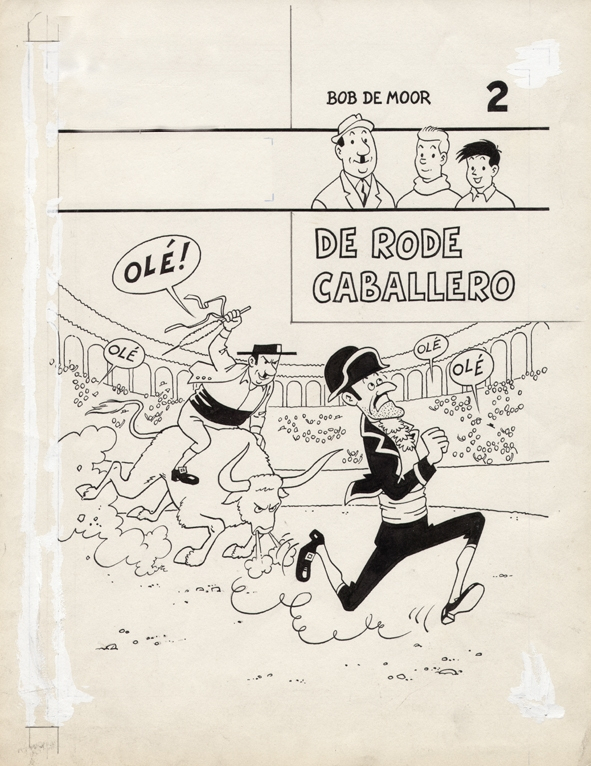 “De rode caballero” or “Le caballero rouge” (or “The red caballero” in english) was the 14th story in the Oncle Zigomar adventures, but only the 2nd album to be published in the Periodica (and Bédéscope) series. Originally the story ran in the flemish newspaper De Nieuwe Gids and this from 22 august 1955 till 4 January 1956. 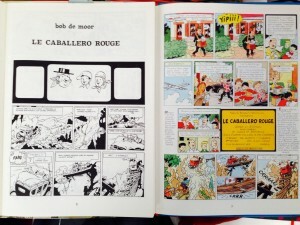 During that time Bob de Moor, who had already started at the Studio Hergé, was working around the clock to get his other non studio work done. The fact that the Oncle Zigomar adventures were published on a daily basis pushed De Moor to his limits with days where he hardly slept. 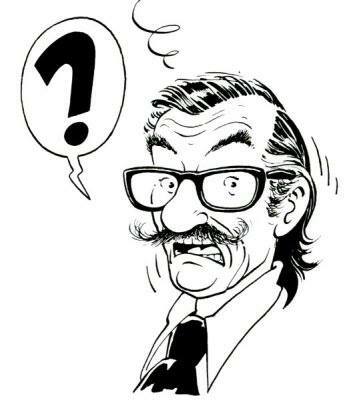 It was the same period when Bob De Moor was also working on the final touches of Tintin‘s “The Calculus Affair”which was published that same year. 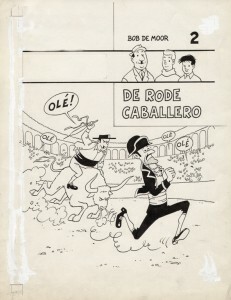 When the comic ended on 4 January 1956, De Moor had no time to waste and play around because on 5 January he already started with the next Oncle Zigomar story, “De sprekende wandelstok” (“The talking cane”) in the same newspaper. 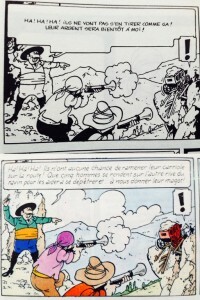 The stories had less background decoration because of this but were still according to the standards at that time for daily newspaper comic strips, quite well developed and full of typical flemish situation humor (there was not really time to develop a joke which of course was the case with Tintin for instance). The cover artwork for this album has undergone significant changes over the years. The one you see the left is the original drawing as Bob De Moor envisaged the album’s cover for the Periodica publisher. But that cover would later on be changed for the Bédéscope publication. In that newer version Don Roycott De Kwiksoep looks to the left instead of the right while running away, Oncle Zigomar sits on a black instead of a white bull and the arena has people visible making it a bit more crowdy than the anonymous crowd you see in this first layout. Right the Rijperman version, left the original version. 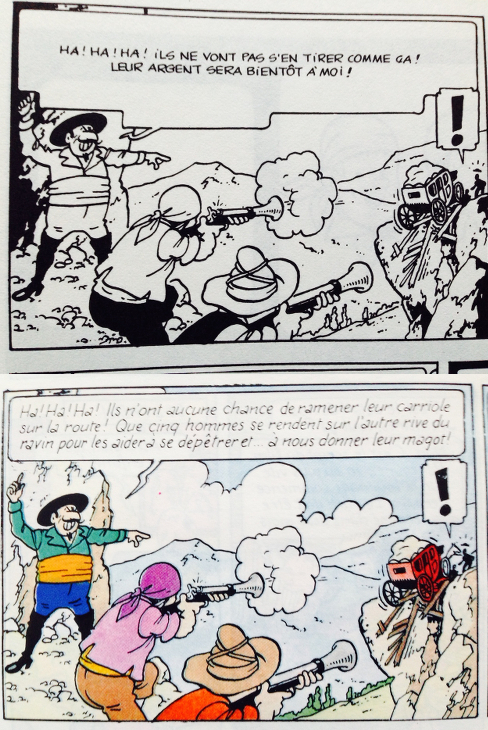 For the colored Rijperman (1989) reissues a brand new cover would be made which had nothing in common with the original cover, but which was closer to the typical Tintin cover artwork though. 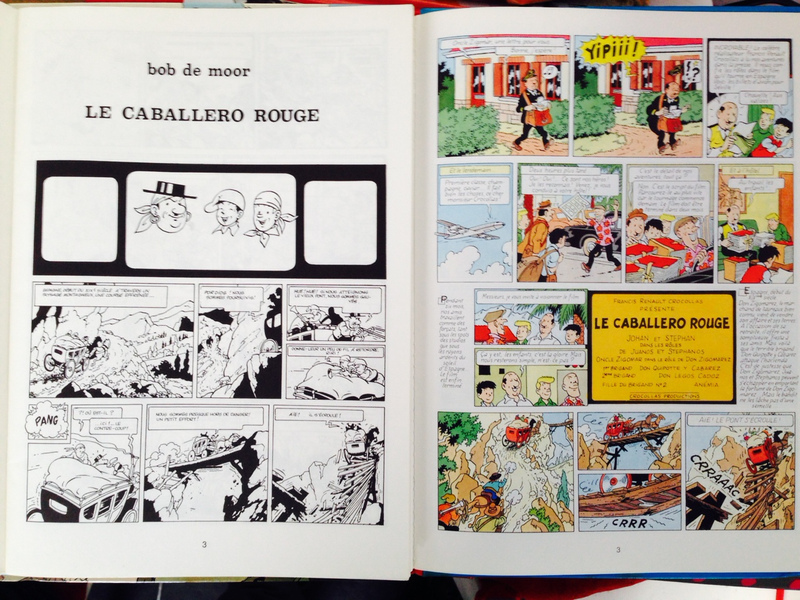 Also to be noted is that for the Rijperman version Bob de Moor completely redrew the first page (see detail on the left). The difference in style between this first page and the ones to follow is noticeable. At the same time, Bob De Moor’s assistent Geert De Sutter took care of removing the shadows and replace them by lines/drawings instead and overal enriched the decors. It must be said that this made the story easier to read visually. On the left you get an idea of how the drawings got much lighter. Also the texts were adapted, and in the case of the dutch version, it kinda lost a bit of its flemish identity. After all, as a dutch speaking but native flemish, the first texts by Bob De Moor were for me very recognizable as being a cleaned up Antwerp based dialect. One immediately knew where De Moor (and Oncle Zigomar) came from, if you were flemish that is. Notice that also the textballoons got a more standard look. We have already scheduled an interview with Geert De Sutter and will come back on this. Note also that BD Must will also re-release these albums. So be on the outlook for more info soon on this site. Note that many albums actually never saw a proper release in french, as for the Dutch speaking market, a very limited run has been published via Brabant Strip in their Fenix series. Also on these releases we’ll be dedicating an article in the future.